© 2016 Ying Zhang, Zi-Cheng Xiong, Kees van Achterberg, Tao Li. A key to the East Palaearctic and northern Oriental species of Rhysipolis Foerster, 1862 (Hymenoptera: Braconidae: Rhysipolinae) is presented. Rhysipolis longicaudatus Belokobylskij, 1994 (stat. nov.) is redescribed, the first host records are given and it is reported new for China. Rhysipolis longicaudatus was reared from Taleporia sp. (Lepidoptera: Psychidae) in Inner Mongolia Autonomous Region and from Bazaria turensis Ragonot (Lepidoptera: Pyralidae) in Qinghai Province. The genus Rhysipolis Foerster, 1862 (Hymenoptera: Braconidae: Rhysipolinae) includes 22 described species (Yu et al. 2012), of which nine species from the Palaearctic region (Belokobylskij 1985, Belokobylskij 1986, Haliday 1836, Papp 1987, Tobias 1976, Yu et al. 2012), eight species from the Nearctic region (one of them up to the Neotropical region) (Spencer and Whitfield 1999), three species from the Neotropical region (Scatolini et al. 2002, Spencer and Whitfield 1999), four species from the Oriental region (Belokobylskij 1988, Belokobylskij and Vu 1988), and one species from the Afrotropical region (Cape Verde Islands, Papp 1996). We present the first key to the East Palaearctic and Oriental species of the genus Rhysipolis Foerster to allow the identification of the reared Chinese specimens.The key can be used as a basis for revising the Chinese Rhysipolis species. The recorded hosts of Rhysipolis species mainly belong to the lepidopteran families Gelechiidae and Gracillariidae, but also Choreutidae, Cosmopterigidae, Elachistidae, Hesperiidae, Lyonetiidae, Momphidae, Pyralidae, Tineidae, Tischeriidae and Tortricidae have been reported (Belokobylskij 1988, Gates et al. 2002, Marczak and Buszko 1994, Shaw 1983, Shaw and Askew 1976, Spencer and Whitfield 1999). In this paper, we report Taleporia sp. (Lepidoptera: Psychidae) and Bazaria turensis Ragonot (Lepidoptera: Pyralidae) as hosts of Rhysipolis longicaudatus Belokobylskij, 1994 (Belokobylskij 1994) (stat. nov.). The isolated records of non-lepidopterous hosts (Curculionidae, Bostrichidae, Tephritidae, Otitidae and Anthomyiidae) need confirmation. Mature larvae of a bagworm moth, Taleporia sp. (Lepidoptera: Psychidae) were collected in Etuoke (Inner Mongolia Autonomous Region), and larvae of Bazaria turensis Ragonot (Lepidoptera: Pyralidae) in Dulan County, Qinghai Province, NW China. The larvae were brought to the laboratory and maintained in a large nylon cage at room temperature. All larvae were checked daily for pupation and parasitoid emergence. Emerged parasitoid larvae and pupae were kept individually in glass tubes (100 mm long and 15 mm in diameter) with a piece of filter paper dipped in distilled water in order to prevent desiccation and plugged with absorbent cotton. The hosts were identified by Prof. Hou-Hun Li (Nankai University, Tianjin). For the morphological terminology used in this paper see van Achterberg (1993) and Harris (1979). The descriptions, measurements and figures were made with a Leica M205A microscope (Leica Microsystems (Switzerland) Limited). Focused photographs were combined using Leica DFC550 with Leica Application Suite (Version 4.5.0). The specimens and hosts are deposited in the Insect Museum, General Station of Forest Pest Management (GSFPM), State Forestry Administration, Shenyang, P. R. China, and Naturalis Biodiversity Center (RMNH), Leiden, the Netherlands. Female. Length of body 2.7–4.0 mm, and of fore wing 2.9–4.0 mm (Figs 1, 2, 3, 4, 5, 6). Rhysipolis longicaudatus Belokobylskij, female, China, Etuoke. Habitus, lateral view. Rhysipolis longicaudatus Belokobylskij, female, China, Etuoke. Rhysipolis longicaudatus Belokobylskij, female, China, Etuoke. 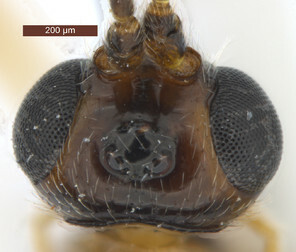 Basal antennal segments. Head (Fig. 2). Head width 1.6 × its median length in dorsal view, 1.1 × width of mesoscutum, smooth with uniformly white setae. Temple behind eye (dorsal view) roundly narrowed. Frons (Fig. 2b) flat and smooth, medially weakly concave, sparsely white setae along the eyes. Ocelli medium-sized and near stemmaticum distinctly concave. POL 1.1 × Od, 0.5 × OOL. 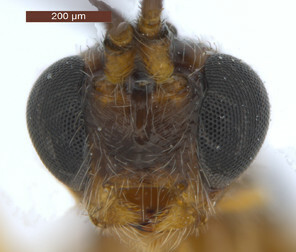 Eye glabrous, slightly concave near antennal sockets, 1.3 × as high as wide, 3.1 × temple in dorsal view. Diameter of antennal sockets 0.9 × distance between antennal sockets, 1.7 × distance between socket and eye. Face (Fig. 2a) smooth with long white setae and oblique rugae below sockets; width of face 0.8 × height of eye and 1.2 × height of face and clypeus combined. Length of malar space 0.2 × height of eye, 0.8 × basal width of mandible. Malar suture absent. Clypeus suture distinct. Hypoclypeal depression round, 1.9 × as wide as distance from depression to eye and 0.5 × as wide as face. Occipital carina complete dorsally, joining hypostomal carina at base of mandible. Antenna (Fig. 3) with 28-34 segments, setiform and slender, 1.1–1.2 × longer than body. Scape 1.5 × longer than its maximum width. Third segment 3.5 × longer than its apical width, 0.9–1.0 × fourth segment. Penultimate segment 1.9 × longer than its maximum width, 0.8 × longer than apical segment. Mesosoma (Figs 4a, 5a). Length of mesosoma 1.7 × longer than high. Pronotum convex laterally with irregular wrinkles. Median lobe of mesoscutum (Fig. 4a) distinctly convex, smooth with uniformly long white setae; median portion in posterior with fine longitudinal carinae. Most portion of lateral lobe glabrous. Notauli with fine wrinkles, deep in anterior half and shallow in posterior half. Scutellar sulcus wide, with a high median carina, smooth, 0.3–0.4 × as long as scutellum. Scutellum flat, smooth with uniformly white setae. Metanotum conspicuously concave, with short wrinkles. Upper portion of mesopleuron (Fig. 5a) with obvious wrinkles and white setae, most of median portion glabrous, white setae in posterior area; speculum concave; prepectal carina complete, joining with anterior of mesopleuron; precoxal sulcus distinct with fine crenulate. Propodeum (Fig. 4a) roundly convex, median smooth except for anterior and posterior rugose areas; median carina strong, 0.6 × as long as propodeum, lateral areas of median carina obviously concave with transverse wrinkles. Wings (Fig. 6). Fore wing (Fig. 6a): length about 3 × as long as its maximum width. Pterostigma 5.3–5.4 × as long as its maximum width. Vein M+CU1 straight; vein r-m present; vein 1-SR+M almost straight; vein r arising behind middle of pterostigma; 2-SR 2.3 × as long as r, 0.7 × as long as 3-SR, 0.5 × as long as SR1, 1.9–2.0 × as long as r-m; 1-CU1 0.3–0.4 × as long as 2-CU1. Hind wing (Fig. 6b): vein M+CU1 almost straight; 1-M 1.1–1.3 × as long as M+CU1; vein SR present; vein 3-M obvious and straight. Legs (Figs 1, 5b). Hind coxa 1.9–2.0 × as long as wide, smooth with long white setae; hind femur 5.3–5.6 × as long as wide; hind tarsus 0.9 × as long as hind tibia; basitarsus 0.6–0.7 × as long as second-fifth segments combined; second segment of hind tarsus 0.5–0.6 × as long as basitarsus, 1.7–1.8 × as long as fifth segment (without arolium). Metasoma (Fig. 4b). Length 0.8–0.9 × as long as head and mesosoma combined. Dorsope large, triangular. Apical half of first tergite uniformly convex, with finely striate and transverse sculpture between striae; apical margin with obviously oblique wrinkles; dorsal carinae strong, distinctly converging, length 0.5–0.6 × as long as first tergite; apical width 2.0–2.3 × as long as its basal width; length of first tergite 0.9–1.0 × as long as its apical width. Remaining tergites smooth, with uniformly white setae. Hypopygium large, triangular. Ovipositor sheath 0.6–0.7 × as long as metasoma and 0.3 × as long as fore wing (Fig. 1). Colour. Dark brown to blackish brown (Fig. 1). Mandible (apically dark brown), palpi, pronotum, legs (but telotarsus and claws dark brown), tegulae and pterostigma brownish yellow; middle lobe of mesoscutum, scutellum and mesopleuron, dark brown with reddish brown pattern; wing membrane subhyaline, veins brown. Alternatively, head (but stemmaticum dark brown), mesosoma (propodeum blackish brown), palpi, legs (telotarsus and claws brown or dark brown), tegula and pterostigma yellowish brown; antenna dark brown; metasoma (but apical tergite yellowish brown) blackish brown. Second-fifth tergites laterally and sixth tergite may be yellowish brown. Male. Length of body 2.5–3.1 mm, and of fore wing 2.2–3.2 mm. Antennal segments 28–33, length 2.6–4.0 mm. Length of mesosoma 2.0–2.6 × its height. Length of first tergite 1.0–1.2 × as long as its apical width and apical width 1.9–2.0 × as long as its basal width. 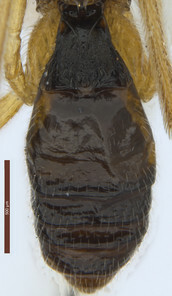 Head, metasoma and antenna, dark brown; palpi, mesosoma (propodeum brown), legs (telotarsus and claw brown), tegula, pterostigma and veins, yellowish brown. 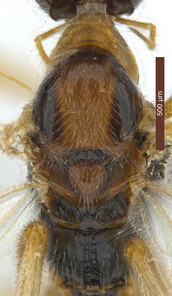 Alternatively, face (median with little reddish brown), mandible (apical black brown), palpi, pronotum, legs (tarsus and claw, brown), tegulae, pterostigma, vein, yellowish brown; antenna (ventral of scope yellowish brown), dark brown; vertex, frons (lateral margin dark reddish brown), temple, scutellar sulcus, precoxal sulcus, dark reddish brown to dark brown; metanotum, propodeum and first tergite, blackish brown or first tergite dark yellowish brown and remaining tergites dark brown. Setose part of ovipositor sheath about 0.7 × as long as hind tibia (its total length about 1.3 × tibia); clypeus and mesoscutum medially yellowish, with face and mesoscutum laterally dark brown; propodeum with closed, parallel-sided and laterally lamelliform areola, sculptured medio-posteriorly, without semicircular smooth and shiny convex area; notauli present posteriorly (Fig. 4a); mesoscutum finely sculptured medio-posteriorly; vein M+CU of hind wing 0.8–1.0 × as long as vein 1-M; mesoscutum steep anteriorly. This species was described by Belokobylskij (1994) as a subspecies of R. meditator (Haliday). It is treated here as a valid species because the differences in the ovipositor length, the shorter temples, the colour of the clypeus and the mesoscutum and the shape of the propodeal areola indicate that it is a separate species. Colour and shape of the propodeal areola are similar in R. setmus Papp, but the latter species has the head and the mesoscutum entirely brownish yellow, the first tergite largely smooth and a shorter ovipositor sheath. NW China: Inner Mongolia Autonomous Region; Qinghai (new record for China); Far East Russia. Reared from the larvae of Taleporia sp. (Lepidoptera: Psychidae) on Caragana korshinskii Kom. (Leguminosae) and from Bazaria turensis Ragonot (Lepidoptera: Pyralidae) on Nitraria sp. (Zygophyllaceae). First host records. – Mesoscutum (except some rugosity medio-posteriorly) smooth (Fig. 4a); medially ventral rim of clypeus near lower level of eyes (Fig. 2a); [carinae of posterior areola of propodeum lamelliform and parallel-sided (Fig. 4a)] R. longicaudatus Belokobylskij, 1994, stat. nov. The authors are deeply grateful to Drs. Anu Veijalainen (subject editor), Michael Sharkey (Department of Entomology, University of Kentucky, USA), Julia Stigenberg (Swedish Museum of Natural History, Stockholm, Sweden) and one anonymous referee for valuable comments and suggestions. We are also indebted to Prof. Hou-Hun Li (Nankai University, Tianjin, China) for identifying the hosts. This research was supported by the “Twelfth Five-year” National Science and Technology Support Program of China (Grant No. 2012BAD19B0701) and the National Natural Science Foundation of China (NSFC, No. 31070585, No. 31310103033). Survey of the parasitic Hymenoptera on leafminers in California. A glossary of surface sculpturing. Braconid wasps (Hymenoptera, Braconidae) reared from mining Lepidoptera. 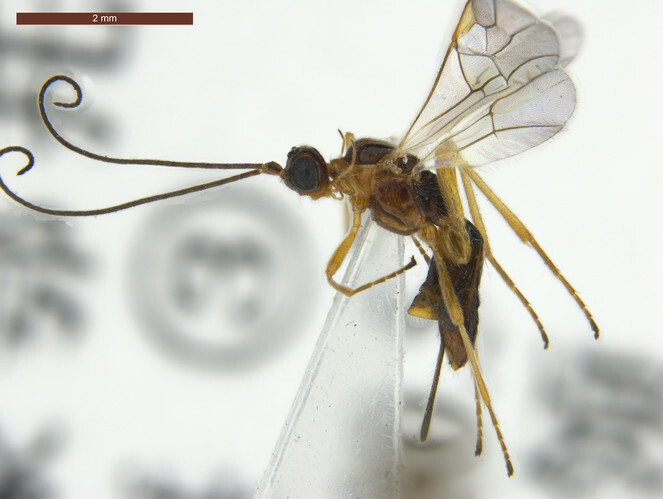 Pseudorhysipolis gen. n. (Hymenoptera: Braconidae: Rhysipolinae) with nine new species from Brazil, Suriname and Panama. On evolution of endoparasitism: the biology of some genera of Rogadinae (Braconidae). Braconids of the Caucasus (Hymenoptera, Braconidae). Illustrated key to the subfamilies of the Braconidae (Hymenoptera: Ichneumonoidea).